Two undergraduates of one of the South East state university have been arrested by Enugu State Police Command over the murder of a Nigerian woman based in the U.S. 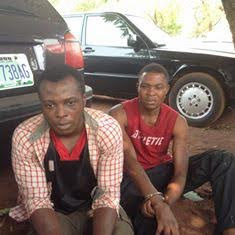 According to the statement issued by the Command, the suspects identified as James Okoh and Victor Uchenna Okefie are both helping the operatives of the Anti Kidnap Unit of the Enugu state command of the Nigeria police Force in their investigations in relation to their role leading to the untimely death of a lady identified as Mrs stella Uhuo who was trapped in Enugu on the day of her arrival from United states of America where she had gone for vacation. It was gathered that on that fateful day, 14th November, 2015, deceased person Stella Ohuo had allegedly contacted James Okoh, a final year sociology student of the said university and from Amata in Afikpo local Government Area of Ebonyi state whom she had known for long and usually assist the deceased in cab activities and other commercial errands, that she will be landing from the US trip to Enugu Airport on that fateful day. James was to convey her to Abakiliki and deliver some luggage given to her by some friends in United state of America. On the said day, Okoh came to the Airport with his friend identified as Victor Uchenna Okefie in a Volvo car alongside some family members of the deceased who came to welcome her. On arrival at the Airport, personal luggage of the deceased was said to have been put in the car brought by the family while the ones to be taking to Abakiliki were loaded into the boot of the volvo car with registration number LAGOS EKY 855 CY. It was further gathered that the family members had allegedly left with the personal luggage of the deceased while Okoh, Okefie left with the deceased and some luggage to Abakiliki. Along the way, okoh and okefie diverted the car off the busy Enugu Abakiliki Expressway to a road side off the expressway at about 10AM of that fateful day,a nd at that juncture it became obvious to the deceased that something is wrong. To Okoh and Okefie that was a ripe time for them to execute their illicit plan of dispossessing the deceased of all the luggage contained in the car but resistance was shown which saw the deceased being beaten while in the car by the two of men until the deceased gave up her ghost. On noticing that the woman had given up her ghost, they quietly and smartly brought her to a dust bin located near Enugu/ Abakiliki Expressway and dumped her body there and left with the luggage and ransacked all the items contained therein including some dollars, male cloths and ipads amongst others and fled. Suspects have been at large since the commission of the dastardly act until the operatives who had been on their trail recently nabbed Okoh on 29th january,2016 in his hostel at Ebonyi state while okefie was trailed to his parents house at Ajaokuta in Kogi state on January 31,2016 where he was nabbed.To suspects,they are regretting their illicit act pointing out that it was not their intention to kill the woman but to collect the luggage and escape but the resistance of the woman made them to try to beat her up so that it can be weak and that way paved way for their smooth operation but it is unfortunate that the woman died. Suspects however are begging for forgiveness. 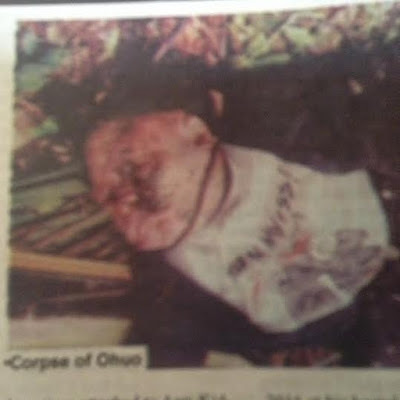 Meanwhile,deceased is said to have been helping okoh one of the suspects for many years back before this incident and that was why she had the trust of calling him to convey her as usual to Abakiliki and Unknown to her that okoh and okefie had perfected arrangement to take her to the great beyond. A full scale investigations have commenced into the alleged incident just as the deceased dead body has been in a nearby mortuary pending the conclusion of the investigations.